The Rev. Dr. Paul Shupe has been an ordained minister in the United Church of Christ for more than thirty years, serving as pastor and teacher at Foreside Community Church UCC in Falmouth, Maine, Lake Edge UCC in Madison, Wisconsin, and currently as Senior Minister of Hancock UCC in Lexington, Massachusetts. 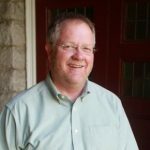 At Hancock, in partnership with Andover Newton at Yale Divinity School, he developed and still supervises the Cooperative Master of Divinity degree program, which immerses MDiv students full-time into the work of the church while in seminary. With his wife MaryAnn, he has two grown sons, Nate and Sam. MaryAnn is a retired special education teacher and a creative artist working in mixed media, especially fabrics and natural and repurposed items. Paul enjoys reading history as well as fiction, hikes and bikes, spends a portion of every day pondering God’s beloved Boston Red Sox.